Your business or Organization can put together a team to participate in the first ever Tri-Cities Community Blindfold Walk as a group. Each team will have their own name, can dress up, and take on the blindfolded mile together. This is a great team building event that supports an awesome cause. Teams are 4-6 people but there is no limit to the number of teams that a business or organization can have. In addition, each team will be asked to raise $500 (or more) in support for the event. Your team will get their own peer to peer web page that will make sharing the event and your team information through your social media platforms easy. You will be able to upload pictures and write a personalized message to share with your friends, family, and co-workers. Step 1: Recruit a team: Team = 4 - 6 walkers including a team captain. Step 3: Register your Team: The entry fee is $10.00 per person due at the time of registration. Click on the "Individual/Team Registration" link above. Put the total $ amount in the “Team Registration” box and click donate. Step 4: Become a Fundraiser: Click on the green “Become a Fundraiser” button on our FUNDRAISING PAGE and following the team setup instructions. Rather than entering your name, enter your team name as the “First” and “Last” name. You will be able to set up your own Team fundraiser page. Each team is encouraged to raise $100.00 per person or $500.00 per team. Step 5: Share with your friend and Family: Share your fundraising page with your friends and family and ask them to support your team as you walk the blindfolded mile. 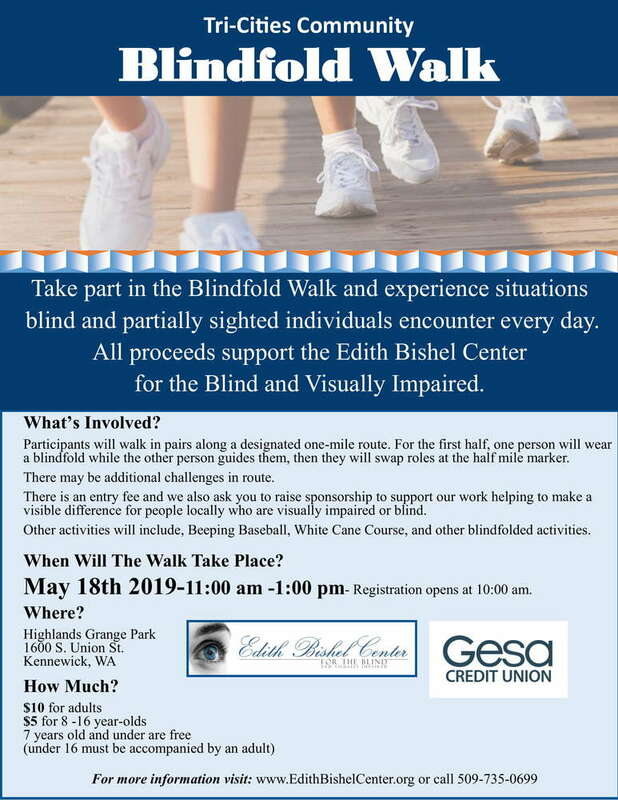 Step 6: Join us on May 18th: Join the community as we take on the blindfolded mile to raise awareness and support for the Edith Bishel Center for the Blind. The Edith Bishel Center for the Blind and Visually Impaired is a 501(c)(3) nonprofit organization dedicated to serving the blind and visually impaired in southeastern Washington. Our mission is to enrich the independence and quality of life for individuals who are blind and visually impaired. We are proud to serve Benton, Franklin, Walla Walla, Columbia, Yakima, and Klickitat counties.